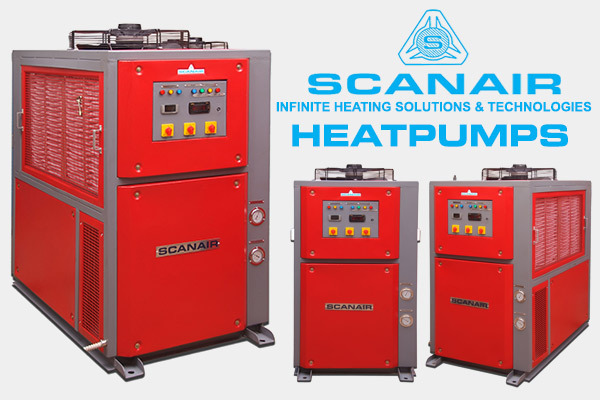 Scanair presents an innovative range of heat pumps with improved efficiency and advanced technology. Our heat pumps are provided with shell and coil multiple liquid injection heat ex-changers that have powerful heating ability, low noise, low vibration, high efficiency and reliability. Scanair heat pumps will maintain the temperature range from 25˚C To + 65˚C˚ ± 1˚C, capacity from 1Kw to 150Kw From5LPM to 300LPM with different flow capacity. Scanair Heat pumps fabricated through easy and practical to open side panels for servicing and plumbing, refrigeration accessories and electrical accessories. Compressors incorporate in a various safeguards that ensure durability including an internal pressure relief valve, motor temperature protections with superior oil management functionality. These heats pumps are ozone friendly, packaged type have been designed for many years of trouble free operation. Scanair heat pumps ideal and most suitable for a wide spectrum of applications in industries like Commercial building water heating, Hotels, Restaurants, theatres, Shopping malls and Boutiques, Hospitals, Diaries, Canteens, Institutions, Hostels, Household water heating, Industrial application, Pre-heating for seed drying, Laundry applications, Drying application needs, Swimming pool heating etc,. 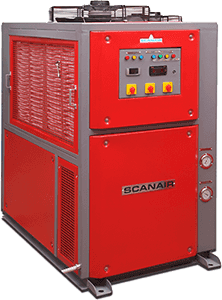 Scanair is the manufacturer of advanced heat pumps in the industry, which supplies more energy than they consume by extracting heat from the surroundings. Currently heat pump systems can supply as much as 4 to 5 kw of heat output for just 1 kw of energy input. Heat is extracted from outside air (or) water, from the ground, or from other low grade heat sources. Heat from any of these sources is used to heat air or water for various heating needs. heat pumps can also be used for free cooling and de-humidification. Other heating systems doesn’t have these advantages. This well-proven technology has been in use for decades and Heat Pumps are at work all over the world providing safe, reliable heating and cooling at affordable cost. Heat pumps are effective solutions to heating and cooling applications for all types of buildings, domestic, commercial and including hotels and residential complexes. A new type of Scanair heat pump challenging promise for extreme climates is the Cold Climate Geothermal heat pump which operates efficiently at extremely low temperatures even below 0 degrees Celsius. The Cold Climate heat pump detects the minimum amount of energy needed to provide the desired level of heating or cooling and adjusts its output up or down, so it never wastes energy. It’s an extremely green house alternative solution.